The municipality of Deutschlandsberg is one of five Styrian pilot municipalities. 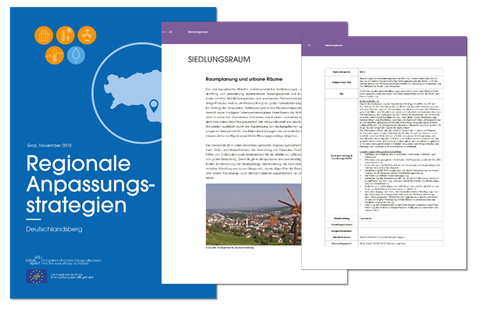 After four workshops in which citizens of Deutschlandsberg dealt with the climatic future and with measures for adaptation to climate change, the first final product is now available - a regional action plan with measures for adaptation to climate change. The first two workshops discussed how the climate in Deutschlandsberg will change by the end of the century and, above all, what this change will mean for the citizens of the municipality. For example, a doubling of the number of heat days by the middle of the 21st century is expected if no sufficient climate protection measures will be taken. The increasing heat will have enormous effects on human health, working conditions and construction measures (e.g. cooling). According to the Central Institute for Meteorology and Geodynamics, an increase of heavy rainfall events in the community is also expected. In the third workshop, regional measures for adaptation to climate change for five sectors (settlement area, supply security, health, social affairs and education, economy, agriculture, forestry as well as ecosystems) were developed together with citizens of the community. Stakeholders selected from a variety of proposed measures those that they considered meaningful and important for their community. These measures were then processed into an action plan, which now contains around 50 measures. For each measure, the respective objectives, implementation steps and responsibilities are described. Such an action plan is still unique, no other municipality in Styria can refer so far to its own action plan, in which regional adaptation strategies were worked out on municipality level. Deutschlandsberg has recognised that damage can only be avoided and opportunities for many sectors and economic sectors can only be profitably exploited with proactive planning and implementation of adaptation measures. According to current studies (COIN study by Karl Steininger), a lack of implementation of adaptation measures is associated with considerable costs until 2050. This underlines the urgency of taking climate change adaptation, but also climate protection, into account more in all areas and placing both issues higher on the political agenda.